States and abroad began making documents, services, and information available online. The purposes of implementing e-government were not only cost-saving for the agencies, but in an increasingly Internet-saturated world, the availability of e-government offered convenient access for people compared to having to go to a physical building.1 For those without computers and the Internet, however, the move to e-government was problematic. the United States and other countries.8 However, while libraries’ roles as providers of government information are not new, the intensity of the expectations of assistance from librarians and library staff has dramatically increased as government offices have moved their services online and, in some cases, closed their physical offices in communities. There is a large body of literature about the engagement of public libraries with e-government that offers an in-depth analysis of the history, progression, implications, and recommendations for public libraries concerning this somewhat new service role as facilitators of e-government. But the e-government literature does little to address the role of public library websites. Are public libraries offering e-government assistance through their websites? It is possible that one reason the question of e-government on library websites is not widely covered in the bulk of the existing literature on e-government in libraries is because the focus of the literature has been the disproportionate impact that government offices moving their services online has had on the technology “have nots” in society. For example, Gibson, Bertot, and McClure found that 52.4% of people who access e-government at libraries do not have a computer at home, and 42.4% lack access at both home and work.9 Providing access through the library website would be less useful for people with access issues. However, a great deal of public library users overall do have access to computers and the Internet and might be interested in the library providing access to e-government through their websites. 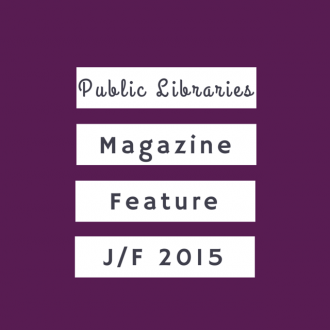 Should Public Library Websites Offer E-Government? It may be surmised that online assistance with navigating e-government would also be a useful service for library users. Hopton and Freund reported that the 2011 survey of Canadian librarians found that while 80% of librarians agreed that e-government made government information more accessible to the public, only 37% thought that search engines were effective tools for locating it, and only 16% thought e-government information was easy for patrons to find.23 Freund also described a study where researchers went to public libraries with laptops and “asked people to search for Canadian government information on a number of common search topics. . . . The majority of searchers used Google rather than government portals, and more than a quarter of all searches did not result in useful information. . . . [T]he majority (68 %) of documents selected were from sources other than the Canadian government.”24 With 91.8% of U.S. public libraries reporting that they are assisting users with government websites (as cited above), it may be safe to assume that the results with U.S. library users might be similar to these Canadian users. While the literature on e-government in libraries does not directly state that having e-government items on public library websites is a recommended best practice, it does suggest that many library users benefit from librarians’ help in finding the government information they are seeking, as finding government information and using government websites can be difficult for users. It also holds up some excellent library websites that have e-government as positive examples. This suggests an indirect recommendation that public libraries provide vetted links and information on their websites, or perhaps offer online pathfinders to government sites. Whether it is desirable to have e-government links, forms, or information on public library websites is linked to two implicit or explicit assumptions by the website designers. First is an acceptance of the concept that the public library is a conduit through which people access e-government. Several authors have argued convincingly that this is the case, at least for the physical library in the form of providing computers with Internet access and assistance in using government websites, forms, and so on.25 The second assumption is that of conceiving of the library website as electronic outreach to a dispersed clientele, or a digital branch of the library.26 For people who do not wish to come into the physical library, a site with an organized approach to e-government can help them navigate to appropriate government sites. Also related is the practical question of: Who is responsible for creating and maintaining public library website content? In other words, who might decide whether e-government items will be on the websites? Chow, Bridges, and Commander found that about a third (33%) of library websites were designed by a librarian as part of his or her job, with 28.4% designed by an “other” category (volunteers, state libraries, or committees), and 21.2% by an outside company. Half of the sites were managed by a librarian (50%), with 18.2% managed by “other.”27 While they addressed content as well as design features in their study, these authors did not mention e-government content or links as an observed or recommended feature of websites. These findings suggest that as many as two-thirds of library webpages are not designed by librarians, and half are not maintained by librarians. Therefore, the question of e-government content on library websites may be slipping through the cracks of professional input. The conclusion from this review of the literature is that most of the works in the literature about e-government and public libraries do not mention the library website as a tool for making e-government more accessible and findable for people outside of the building. At the same time, authors addressing website design do not mention e-government as a potential item of interest for library sites. Also lacking is philosophical debate over whether the library website is a recommended venue for facilitating users’ e-government needs. What types of e-government items do public libraries have on their websites? What characteristics of libraries are related to a higher likelihood of having e-government items on the website? Is the quality/complexity of the website overall related to a higher likelihood of having e-government items on the website? The 2010 Public Libraries in the United States Survey (PLS) by the Institute of Museum and Library Services (IMLS) was used as a sampling frame from which a simple random sample of public libraries was chosen.28 There were 9,308 libraries in the PLS and a sample size calculator was used to determine a sample size of 369 libraries. Of these 369 libraries, 323 (87.5%) had websites. These websites were examined in 2012 with a content analysis check sheet and sites were marked for the presence or absence of a number of variables. The resulting data were paired with the PLS data set for those libraries to allow analysis using a variety of background factors documented in the PLS data set such as the population of the service area, funding variables, and location variables. Data were analyzed with percentages and cross tabulation tables, and chi square was used to test the bivariate comparisons for statistical significance. Multiple regression and correlation were used to test for relationships between library size variables and e-government item scores. Limitations of the study were that the websites were only viewed from a computer and not from a mobile device or through mobile apps. Many public libraries have alternative sites for mobile device users and content may vary from that provided on websites designed to be viewed from a computer. Also, some of the public libraries used social media sites such as Facebook in lieu of having a more traditional website. These types of social media library pages were not included in the study. While one Canadian study suggested that public libraries in that country were cataloging government websites and adding them into their online catalogs, this study did not search the library online catalogs, just the websites themselves. The dependent variables in the study were the e-government items from the data collection check sheet where items were checked either yes or no and coded 1 or 0 in the dataset. These items included federal links, federal information, federal forms, state links, state information, and state forms. The subject of the links, information, and forms was coded separately as taxes, unemployment, child services, and other. Scores were computed that determined how many possible items a website contained, and these variables were labeled FedScore and StateScore, each with a range of 0 to 3, and a composite EgovScore with a range of 0 to 6. The variable Website Score was created by combining the variables “subpage of city website,” “website has subpages,” “ease of use,” “complexity,” and “broken” (broken links, empty pages, and so on). While there was a potential range of zero for a very poor website to 8 for an excellent site, actual scores ranged from a low of 2 to a high of 8. Since three of the variables that went into computing Website Score were at the ordinal level of measurement, Website Score was considered an ordinal variable for this data analysis. This section of the data analysis addresses the first research question: What types of e-government items do public libraries have on their websites? 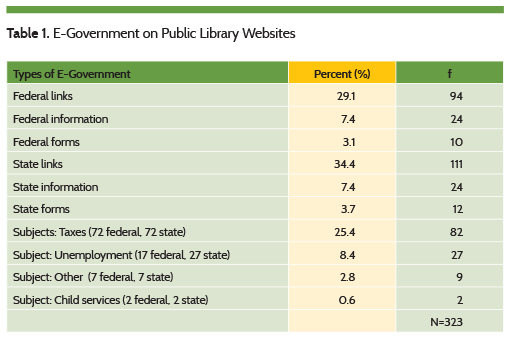 The majority of public libraries did not have e-government items on their sites, but a sizeable minority—39.6% of libraries—did (128 out of 323). The websites were slightly more likely to contain state e-government than federal e-government, with 112 (34.7%) containing some kind of state e-government items and 96 (29.7%) having some kind of federal e-government items. Links to federal and state websites were the most common manifestation of e-government, but a small number of libraries also contained e-government information, and an even smaller number of sites had state and federal e-government forms. For those that did have e-government on their sites, it was predominately related to taxes. In fact 25.4% (82 out of 323 sites) had federal and/or state tax items. Nine libraries had federal tax items only, another 9 had state tax items only, and 63 had both federal and state tax items. Of these, 71 had links to federal tax sites, 17 had federal tax information, and 10 had federal tax forms. Also, 71 had links to state tax sites, 16 had state tax information, and 11 had state tax forms (see table 1). How were the different types of information combined on the websites that contained them? Were libraries more likely to have one kind of information and not others, or did most sites that had some kind of e-government generally have more than one kind? Table 2 shows the relationship across different types of e-government on the websites. 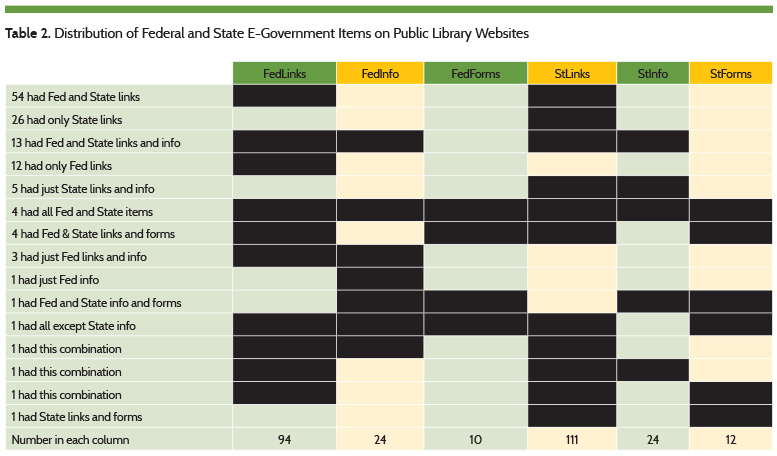 A total of 128 library websites had some kind of e-government items: 80 sites had both federal and state items, 32 had state with no federal items, and 16 had federal with no state items. As can be seen in the table, the most common representation of e-government items was sites with federal and state links (54 sites). An additional 26 had only state links and 12 had only federal links. The remaining 36 of the websites that had some e-government had a variety of combinations of items. There were 195 library websites that had neither state nor federal items of any kind. This section of the data analysis uses bivariate and multivariate analyses to examine the second research question: What characteristics of libraries are related to a higher likelihood of having e-government items on the website? Also examined is the third research question. In the following bivariate tables, the federal and state items were condensed into two variables, one that indicated if there were any federal items and one if there were any state items on the websites. First examined are library variables such as whether the library employs ALA-MLS librarians, whether the library has branches, and type of governing agency. 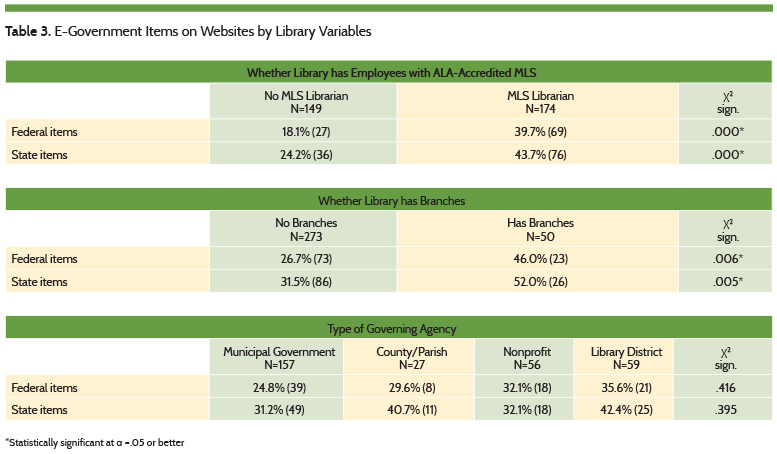 Libraries with ALA-MLS librarians were about twice as likely to have e-government items on their websites than libraries without. Additionally, libraries with branches were much more likely to have e-government items than stand-alone libraries. For both of these calculations, the differences were statistically significant using a chi-square analysis (with alpha level of .05 or better). While there were differences between libraries with different types of governing agencies, these differences were not large enough to be statistically significant. See table 3. The likelihood of libraries having e-government items on their websites differed greatly by location variables. 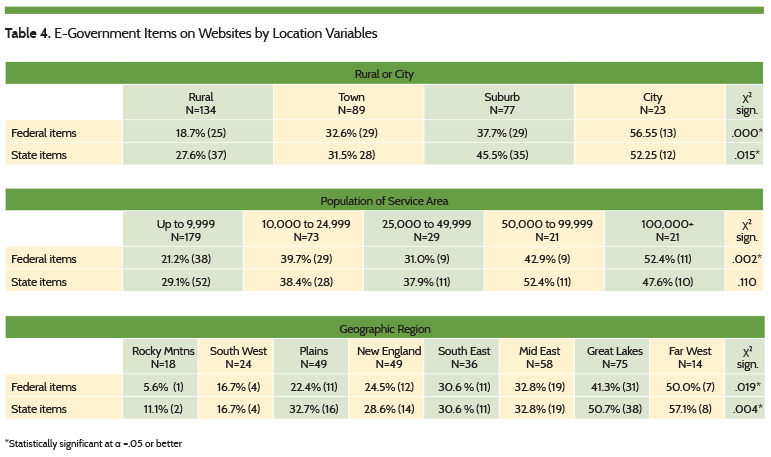 City libraries were more than twice as likely to have federal items on their sites than rural libraries, and nearly twice as likely to have state items. These differences were statistically significant. When examined by the population of the service area (recoded into 5 groupings), libraries in areas of larger population were nearly twice as likely to have federal items and somewhat more likely to have state items. The differences on federal items were statistically significant, but for state items the differences were not great enough to be significant. This is partially a reflection of the greater likelihood of smaller libraries to have state items than to have federal items on their websites. There were enormous differences in likelihood of having e-government items by geographic region, and these differences were statistically significant. Libraries in the Rocky Mountain region and in the Southwest were the least likely to have e-government items on their websites (5.6% to 16.7%), and libraries in the Great Lakes and Far West regions were most likely (41.3% to 57.15). However, the percentages for libraries in the Rocky Mountain region and in the Far West region should be regarded with caution because the N for these two regions was very small—fewer than 20 libraries. About one-quarter to one-third of libraries in the Plains, New England, Southeast, and Mideast regions had e-government items. See table 4. Research question 3 asked: Is the quality/complexity of the website overall related to a higher likelihood of having e-government items on the website? Three subjective evaluations of website quality were collected in the data analysis: the complexity of the site, ease of use, and accuracy as judged by broken links, empty pages, and other problems. When compared with the presence of federal and state items, the complexity of the website was significantly related to both, with nearly half of complex sites having both types of items compared to one-fifth to one-quarter of basic websites. The ease of use results came out differently than expected so a cross-tabulation of ease of use and complexity of website was conducted, which revealed that the more basic the website, the higher the ease of use. This makes sense, as a one-page website would be easier to use than a complex site. Complex websites were mostly likely to have a middle ease of use. When combined with the e-government variables, state items were most likely to be found on websites with a middle ease of use, which corresponds to complex websites. This was a statistically significant finding. The differences concerning federal items were not large enough to be statistically significant. It seems that overall library websites were mostly error-free as 83% of them had few or no broken links, empty pages, and other errors. The presence of e-government items on the sites seemed unrelated to this variable, and the differences across categories were not statistically significant. See table 5. A number of ratio level variables that are indicative of library size were used to examine the created variables EgovScore, FedScore, and StateScore to determine if the presence of these items on library websites was merely a reflection of larger libraries having websites with more information on them, including e-government information. A Spearman’s rho analysis for correlation showed that many of the variables indicative of library size were correlated at a low to low-moderate level with the overall e-government score and the more specific FedScore and StateScore.29 Note that the closer to 1.00 the correlation coefficient is, the stronger the correlation, and for these calculations the statistically significant correlation coefficients ranged from .130 to .273, numbers that show some correlation, but not at a very substantial level.30 The variables with a more moderate correlation to the e-government items were the presence of ALA-MLS librarians, level of local government funding, and population of the service area. Lower correlations were found with the level of state funding, the total expenditure on the collection, and the level of federal government funding. These levels of correlation suggest that while larger libraries may be somewhat more likely to have this information on their sites (as evidenced in the previous bivariate analyses), there are factors other than library size that are predominately responsible for whether or not library websites contain e-government items. See table 6. Regardless of library size, was the overall quality of the website correlated with a higher likelihood of e-government items being represented on the site? A correlation analysis was run with the e-government scores and the variable WebsiteScore. 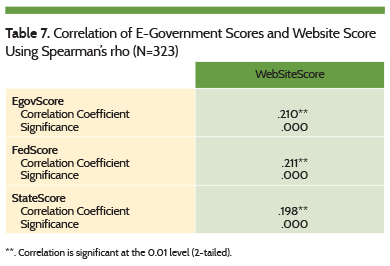 The Spearman’s rho correlation coefficients ranged from .198 to .211, indicating a low-moderate effect of website quality with the presence of e-government items. See table 7. While bivariate correlation presents a comparison of two variables, multivariate regression analysis allows several independent variables to be combined to test whether they interact to create a stronger model predicting the outcome of the dependent variable. The independent variables population of the legal service area, FTE ALA-MLS librarians, total annual expenditures of the collection, and local, state, and federal funding were applied in various combinations to regression models with the dependent variables EgovScore, FedScore, and StateScore. When the independent variables were run separately against each dependent variable, there was almost no predictive value (R2 ranged from .000 to .027). In combination, the above independent variables (excluding federal funding) created a model that predicted 8.8% of the variance of EgovScore, 8.1% of the variance of FedScore, and 8.0% of the variance of StateScore (R2 of .088, .081, and .080; F values of 6.147, 5.574, and 5.476 all significant at .000). These variables that, combined, were representative of the size of the library, predicted less than 10% of the likelihood that the library’s website would contain e-government items. Therefore, it can be concluded that library size is not very strongly responsible for whether or not the libraries had e-government information on their websites. Most public libraries, even very small ones, have a web presence these days, whether it is an independent website or part of a city website. More than one third (39.6%) of public libraries had some e-government items on their websites with the majority of these items being links to government sites and the subject of the links overwhelmingly related to taxes. State e-government items were slightly more likely to appear than federal items. Most websites that had e-government items on them had both federal and state items, with 37.5% having only one or the other. 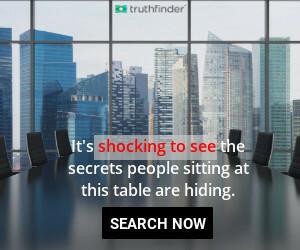 Concerning subjects other than taxes, 27 sites had information relating to government resources for unemployment (17 had both federal and state information and the remaining 10 had only state information). An additional 2 sites had federal and state government information concerning child services. Gibson, Bertot, and McClure, in a multifaceted study on the e-government needs of library users in Florida, found that the majority of requests (39%) were related to taxes.31 While the focus of that study and this study were different, it is heartening to note a continuity between what the libraries are offering (assistance with taxes through the library websites) and the requests of library users for tax help. A variety of variables concerning characteristics of libraries, location, and website quality were related to e-government items on library websites. Many of these variables were indicators of library size such as whether or not the library employed ALA-MLS librarians, whether the library had branches, size of the population served, and whether the library was in a city versus a suburban or rural area. On all of these library size variables, the differences between differently sized libraries were statistically significant with larger libraries slightly or moderately more likely to have e-government items on their websites. Variables not related to library size included geographic region of the country, which was statistically significant, and type of governing agency, which did not show significant differences between libraries. In analyzing the contents of the webpages, was the presence of e-government items simply a reflection of more sophisticated website design? More complex websites were somewhat more likely to have e-government items than basic websites, but even basic websites had these items at a rate of 20 to 25%, compared to nearly half of complex sites. The most easy to use websites were least likely to contain e-government items, most likely because the more basic websites were the easiest to use. Both complexity and ease of use were significantly related to e-government items on the website. The vast majority of libraries had few or no broken links or empty pages, and variations on this item in regards to e-government were not statistically significant. Based on the assumption that larger libraries with more funding would have better websites that would be more likely to contain e-government items, more stringent analysis was done to determine the relationship between library size variables and the dependent variables in the study. Correlation and regression analyses were used to examine the relationship between these variables and the constructed dependent variables EgovScore, FedScore, and StateScore. While the cross-tabulation tables showed that larger libraries were somewhat more likely than smaller libraries to have put e-government items on their websites, these differences were not robust enough to result in substantial correlations or regression models. Correlation coefficients for Spearman’s rho calculations were less than .3, a number range generally considered to be low or lowmoderate. The variables with correlations closer to moderate were the presence of ALA-MLS librarians, level of local government funding, and population of the service area. Library size variables were also not highly predictive for the presence of e-government; the best regression models for these variables were only able to predict less than 10% of the variance in EgovScore, FedScore, and StateScore. What these data are therefore indicating is that, even though websites of larger libraries are somewhat more likely to contain e-government items, most of the variation is due to some other variables and not just a function of library size. At the nuts and bolts level of library website creation, what ends up on the site comes down to the decision of an individual or group of individuals concerning what they think will be important to their library user base. As mentioned in the literature review, Chow, Bridges, and Commander found that many library websites are not designed by librarians, and e-government items are mostly not mentioned in the design literature. Since e-government items are not found on the majority of public libraries’ websites, site designers may either be making a conscious decision to not include these items, or the idea of whether or not to include them is not coming to mind. The way that e-government access manifests on public library websites varies a great deal and, while not part of the quantitative analysis, it could be helpful to supply some specific examples of this variation. A brief comparison of the public library websites of three midsize cities shows some different approaches to e-government items. As an example of a library that is using their website as a digital outreach tool for e-government assistance, the Oklahoma City Metropolitan Library System webpage has a Services section with an extensive Income Tax Resources page and a link to the state’s Documents.OK.gov page. Their Tax Forms and Information page contains 58 federal and state tax documents and forms for download. They also have links to federal and state tax websites plus phone numbers for the federal and state tax offices and a description of the in-library tax services that people can access. In a different approach, the Seattle Public Library predominately uses their site to advertise their in-person e-government assistance and has much less in the way of digital outreach: it has a tax help page that describes their tax help for people who come in to the library, with a single link to the IRS webpage on their site. Washington State does not have state income tax so they obviously would not have state tax information on their site. Seattle Public additionally has a citizenship page that does not contain links to government sites, but encourages people to come to the library and to attend citizenship classes that the library offers. Another similarly sized city, Nashville, does not appear to have tax items on their public library websites, but they have other e-government links related to job searching such as the Tennessee Department of Labor Job Seekers site, State of Tennessee job site, and USA Jobs for federal government jobs. It is possible that Nashville could offer a tax page during tax season and disable the page during other times of the year. It is worth noting that “e-government” is not a term used on library websites because it is not a term that people perusing the sites would use. Instead, links and information are generally located on subject pages or in subject sections such as taxes, job assistance, citizenship, and so on. While this study examined whether or not public libraries are including e-government in some fashion on their websites, an important question for librarians is: Is this a recommended practice? A number of authors have argued convincingly that physical libraries have become indispensable to communities as hubs where people can engage with e-government by using the free public library computers to look up information, fill out forms, request services, and more. As people begin to think of public libraries as a place to go to interact with government agencies through the Internet, it seems a logical step that people will go to the library website to get links to useful government sites. Since the 1990s, libraries have made various attempts to sort useful websites, including cataloging sites, creating lists of useful links or pathfinders, and otherwise helping patrons to navigate the enormous sea of unregulated Internet options. In this light, providing e-government on library websites is a continuation of this established practice. While an information-literate individual may have no problem finding the irs.gov website, a person with less skill may be lured from their Google search to a variety of commercial or other sites and have real difficulty finding the accurate site for their needs. The suggestion of these researchers is that digital outreach through the library website can help people find and navigate the sometimes confusing or difficult-to-find government sites by providing links directly to commonly sought sites and information. The most important measure of whether e-government items are useful on the public library website is if users perceive of these items as something they would find useful. How likely are people, either from inside the library or outside of it, to go to the library site to look for e-government forms, information, or links? This study cannot answer that question. It is recommended that future research gather the opinions of librarians and library users by surveying them directly concerning their expectations in this regard. Lemuria Carter and France Bélanger, “The Utilization of E-Government Services: Citizen Trust, Innovation and Acceptance Factors,” Information Systems Journal 15 (2005): 5–25. Paul T. Jaeger and John Carlo Bertot, “Responsibility Rolls Down: Public Libraries and the Social and Policy Obligations of Ensuring Access to E-Government and Government Information,” Public Library Quarterly 30 no. 2 (2011): 91–116. DOI: 10.1080/01616846.2011.575699. Kathryn Sigler, et al., “The Role of Public Libraries, the Internet, and Economic Uncertainty,” Librarianship in Times of Crisis—Advances in Librarianship 34 (2011): 19–35. DOI: 10.1108/S0065-2830 (2011)0000034005; Paul T. Jaeger, et al., “The Co-Evolution of E-Government and Public Libraries: Technologies, Access, Education, and Partnerships,” Library and Information Science Research 34 (2012): 271–81. John Carlo Bertot, et al., “Public Access Computing and Internet Access in Public Libraries: The Role of Public Libraries in E-Government and Emergency Situations,” First Monday 11 no. 9 (2006). (accessed Aug. 8, 2014); Paul T. Jaeger and Kenneth R. Fleischmann, “Public Libraries, Values, Trust, and E-Government,” Information Technology and Libraries (Dec. 2007): 34–43; Rachael Cathcart, “Librarian or Social Worker: Time to Look at the Blurring Line?” The Reference Librarian 49 no. 1 (2008): 87–91. DOI: 10.1080/02763870802103845. Charles R. McClure, Paul T. Jaeger, and John Carlo Bertot, “The Looming Infrastructure Plateau? : Space, Funding, Connection Speed, and the Ability of Public Libraries to Meet the Demand for Free Internet Access,” First Monday 12 no. 3 (2007). Amelia Gibson, et al., “Community Leadership through Public Library E-Government Services,” Florida Libraries (Spring 2008): 4–7. John Carlo Bertot, et al., “Drafted: I Want You to Deliver E-Government,” Library Journal (Aug. 2006): 34–37. Amelia N. Gibson, John C. Bertot, and Charles R. McClure, “Emerging Role of Public Librarians as E-Government Providers,” Proceedings of the 42nd Hawaii International Conference on System Sciences (2009). Robert Davidsson, “Welcome to the E-Government Library of the Future—Today,” Public Management (Apr. 2008): 16–18; Robert Davidsson, “Serving Government Clients Using Library Electronic Resources,” Florida Libraries (Spring 2006): 10–12; Paul T. Jaeger, “Building E-Government into the Library and Information Science Curriculum: The Future of Government Information and Services,” Journal of Education for Library and Information Science 49 no. 3 (2008): 167–79. Homa Naficy, “Centering Essential Immigrant Help on the Library Web Site: The American Place (TAP) at Hartford Public Library,” Public Library Quarterly 28 no. 2 (2009): 162–75. DOI: 10.1080/01616840902892440. Roswitha Poll, “Evaluating the Library Website: Statistics and Quality Measures,” World Library and Information Congress: 73rd IFLA General Conference and Council, Durban, South Africa (Aug.2007), (accessed Aug. 3, 2014); Anthony S. Chow, Michelle Bridges, and Patricia Commander, “The Website Design and Usability of US Academic and Public Libraries: Findings from a Nationwide Study,”” Reference & User Services Quarterly 53 no. 3 (2014): 253–65; Matthew Reidsma, Responsive Web Design for Libraries: A LITA Guide (Chicago: American Library Association, 2014). Peter Jorgensen, “Webmastering in the Public Library: Creating User-Friendly Websites for Staff and the Public,” Nebraska Library Association Quarterly 32 no. 2 (Summer 2001): 6–9. Jaeger and Bertot, “Responsibility Rolls Down,” 100. American Library Association, “U.S. Public Libraries and E-Government Services,” (2009). (accessed July 10, 2014). Judy Hoffman, John Carlo Bertot, and Denis M. Davis, “Libraries Connect Communities: Public Library Funding and Technology Access Study 2011–2012,” American Libraries digital supplement (June 2012): 1–97. http://viewer.zmags.com/publication/4673a369: 30 (accessed Aug. 8, 2014). American Library Association, “Library E-Government Services” (n.d.) (accessed July 30, 2014). Jennifer Berryman, Egovernment: Issues and Implications for Public Libraries: A Report on Trends and Themes in the Literature for the Public Library Network Research Committee, State Library of New South Wales (Mar. 2004). (accessed July 30, 2014). Luanne Freund, “E-informing the Public: Libraries and E-Government,” Library Connect Newsletter 11 no. 2 (2013). (accessed July 25, 2014). Leah Hopton and Luanne Freund, “The Digital Shift: Librarians and Public Access to Government Information,” Feliciter 57 no. 5 (2011): 197–99. David Lee King, “Building the Digital Branch: Guidelines for Transforming Your Library Website,” Library Technology Reports 45, no. 6 (Aug./Sept. 2009). Chow, Bridges, and Commander, “Website Design,” 260–61. Institute of Museum and Library Services, Public Libraries in the United States Survey (2010), (accessed Aug. 8, 2014). While these variables are at the ratio level, a Spearman’s rho analysis was used instead of Pearson’s r because of factors in the data such as outliers to which the Pearson’s r test is sensitive. David de Vaus, Analyzing Social Science Data (Thousand Oaks: Sage, 2002). Gibson, Bertot, and McClure, “Emerging Role of Public Librarians as E-Government Providers,” 5.